After making so many rich and gooey things this week, I thought I’d switch gears and make something kind of wholesome and useful. This carrot pecan bread recipe is based on an old recipe from a 1984 Southern Living annual, so it’s (at least) 24 years old. Doesn’t it seem strange that 1984 was 24 whole years ago? 1984 seems like yesterday. I hated the ’80s but I sort miss them still. Anyway. This pecan bread, unlike the eighties, is not defined by excess. It has a low but reasonable amount of oil and all kinds of healthy (’60s!) ingredients like whole wheat flour, carrots and nuts. Anna thanks for a great recipe! This was pretty darn healthy…so I made it with one slight change – I replace some of the oil with ground Flax Seed. It was delish so I decided to blog about it to my friends…thanks so much for the inspiration!!! It looks delish and I think it smells wonderful too, Anna! Mimi’s is one of our favorite restaurants and I LOVE the carrot bread. Is there a recipe out there for it? We are now an hour away from the closest one and don’t get there as often. Sigh. Looks right up my alley – I love the carrot bundt cake with applesauce in it that you posted some time back. This looks like a good everyday type loaf. I’ve been missing the 80s lately, too. I think that shows how bad things are right now. Depressing! What I still can’t believe is that I graduated high school in 1984. Where does the time go? Have you ever made the carrot bread from Mimi’s restaurant? I used to love that stuff. Great – a recipe to use some KA whole wheat flour that’s been waiting. Perfect timing as usual. BTW – my hubby loved the PB & Nutella Brownies. He’d never had Nutella and they came out just pefectly. “This bread, unlike the eighties, is not defined by excess.” Anna, you always manage to bring a smile to my face with your fun metaphors, haha – love it! 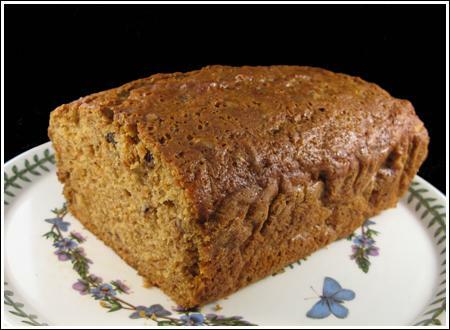 And that bread sounds wonderful – carrot & pecan is a delectable combination! FYI. I weighed my flour and used a total of about 10 1/4 oz — 6 oz all purpose, 4 1/4 oz whole wheat. This isn’t nearly as rich and moist as carrot cake. It’s definitely more of a quick bread — lower in fat, but not rubbery. Just today I bought a big bag of organic carrots to make baby food and was thinking I needed to search for something else to make with the leftovers…Anna to the rescue! Thanks for the timely post. Looks yummy, and you’re right, after all the ooey, gooey stuff, I’m thinking healthy. I’m about to make a healthy whole grain type muffin. Instead of quick breads, I always make them in mini muffin tins. My kids will eat a muffin, but not a slice of bread! Thanks for this recipe, it looks great!